We’re fast approaching the end of October––one of my favorite months––and everything still seems like a rollercoaster. Today is already better than the entirety of the week the preceded it: I am awake, exercised, showered, dressed, and breakfasted and all before 9AM. I worry that I’m overdoing it; I signed up for a $10/mo. subscription to the intelligence analysis company Stratfor, which I probably can’t, technically, afford. But I’m a sucker for a good media subscription deal, and even more of a sucker for that foreign policy/global intelligence analysis. Meanwhile, I’m taking a design class, and we’re moving on to 3D objects this week. Having done a certain amount of playing/learning with an object of our choice (rendered into a silhouette in Illustrator, or your prefered vector graphics program). We must now design packaging for said object––three variations. To determine our approach, we must research the object, and develop a word (ideal) or phrase (acceptable) that conveys a thematic aspect of our object. It turns out that researching the history of the gear, while interesting, is unlikely to provide the sort of information that will genuinely help me develop a thematic understanding of the part. The history of the gear dates back to the 4th c. BCE in Asia and approximately the year 150 BCE in Europe. It is one of the most basic and fundamental parts of mechanical engineering. But I want something more nuanced that “fundamental”. Ultimately, having spent no small amount of time learning about gear sizing. Specifically the importance and measurement of a gear’s “module” (read an expert explanation here) I think that “precision” is the gear’s most important and engaging thematic aspect. Gear sizing is determined at the level of its teeth. For two gears to work together, they must fit together. Therefore, their teeth must apply and react to pressure at the same point along their height. This place where pressure is exerted on and/or transferred to an object is known as the line of action, or line of pressure. On a gear tooth, it is at a point roughly at the center of the tooth height. 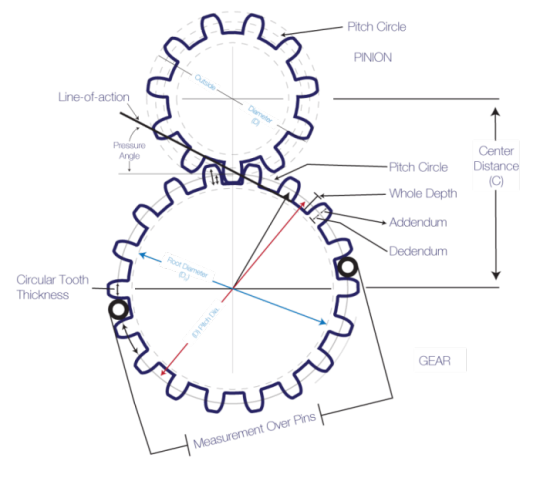 This “center” of the gear tooth falls along what is known as the pitch diameter or pitch circle. This measurement is crucial to determining whether or not two gears will fit together. It is usually given with implied units; in SI those are millimeters (mm) and in BG those are inches (in). It can also be understood as the gear’s diametrical pitch, which is literally the number of teeth per mm (or whichever unit of measurement is being used) of pitch diameter. That is to say: an m of 10mm, means that each gear is 10 mm across at the height of the pitch diameter. Ultimately, this means that the number of teeth on a gear is fixed, because it is determined by the gear’s module (and therefore its pitch diameter) and its root diameter (how big the gear is). All of this is carefully designed, manufactured, and tested; in clean rooms, where not even a particle of dirt can throw off the measurements of a gear’s modulus.